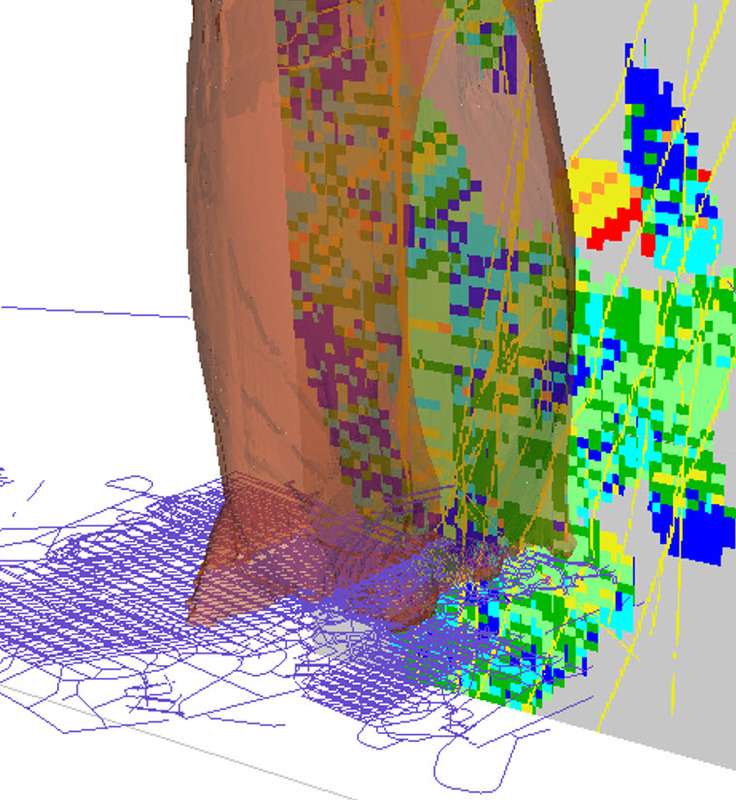 SRK performed a comprehensive redevelopment of the geotechnical model for an existing large panel caving operation with the aim of assisting cave planning and design in five future cave blocks. Initially, separate models were created for the individual blocks to allow for smaller, more focused models; however, a large all-encompassing model was subsequently created. The models incorporated more than 50 geotechnical domains based on major rock types and faults. They were constructed through review of the existing geotechnical drilling (485 drillholes totalling ~250,000 m of core) and underground mapping database as well as incorporating additional data from recent targeted drilling investigations. Careful characterisation and recalculation of key rock mass parameters ensured the final model inputs were appropriate, consistent, and thorough. The products comprised detailed Datamine block models of maximum 25 m and minimum 5 m individual blocks sizes, providing data for lithology type, intact rock strength, rock block strength (as developed for the in situ rock mass rating calculation, weathering, fracture frequency per m, and fracture spacing. RQD; joint number rating; and calculated RMR, IRMR and Q’ classification values. In addition, detailed statistical summaries of the characteristic rock-mass properties and their variability were provided for each domain for use in any geomechanical or numerical analyses. Supplementary in situ stress interpretations using core disking and drillhole breakout data were generally in agreement with past measurements and interpretations. The interaction of faults is important – each cave footprint requires the presence of one or many major faults to assist caving. Stress concentration in weaker rock mass within the fault intersections in the extraction and undercut levels pose an elevated possibility of instability. Sequencing the undercut through this region would be required to manage the possible outcomes associated with undercut angle and initiation point. The parameters controlling brittle behaviour of the rock mass (strain bursting of faces or local seismic responses during undercutting and cave establishment) include high strength rock and low joint number or fracture frequency. The presence of locally, very weak infill (decreasing rockmass strength) has controlled drive scale deformation. The deformation is managed with mine sequencing and ground support systems, and should abate once the undercut and cave have provided a suitable stress shadow. The seismic response to mining has recorded larger magnitude and more events in the south of the mine compared to the north, appearing to be a consequence of rock mass conditions and structural control. This has constrained the location of the planned infrastructure to reduce the potential for future damage. Preconditioning to reduce the occurrence of large damaging seismic events will become a necessity.